Mushkin introduces the Atlas deluxe, a new mSATA SSD claiming to be world's fastest 30GB model in its class. 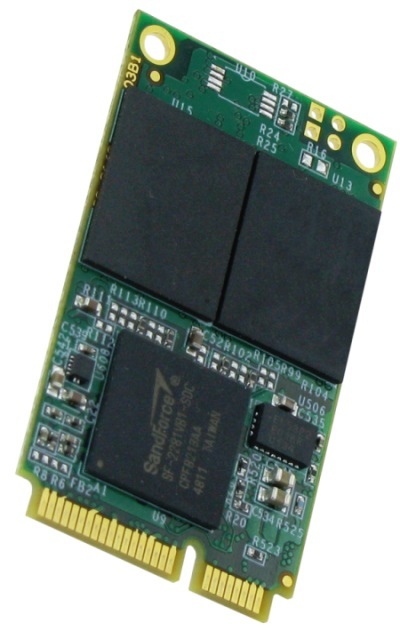 The disk features the SandForce SF-2281 SSD controller, it has a SATA 6Gbps interface and promises read speeds of up to 555MB/s and write speeds of up to 365MB/s, with random 4KB write iOPS of up to 70,000. The Atlas deluxe will start shipping this month but the pricing is still unknown. Mushkin, Inc., an industry-leading designer and manufacturer of high-performance and mission-critical computer products, today announced the worldwide launch of its new 30GB Atlas deluxe(TM) mSATA solid-state drive (SSD), scheduled to start shipping this month. The new 30GB Atlas deluxe(TM), the latest from the award-winning mSATA SSD product line, is the fastest on the market, featuring read/write speeds up to 555/365 megabytes per second, and 4KB random read/write IOPS up to 92,000/70,000. Atlas deluxe(TM) delivers SSD reliability and performance, in a lower-powered, smaller mSATA SSD form factor that measures about an eighth of the size for easy installation on any device with an mSATA slot. Validated for NVELO Dataplex(TM) caching software and Intel(R) Smart Response Technology, the Atlas deluxe(TM) mSATA is well-suited as a cache for existing hard drives or as a standalone SSD for thin and light laptops and Ultrabooks(TM). "Atlas deluxe(TM) is one of the top mSATA SSDs on the market today, having won Editor's Choice from TheSSDReview.com for delivering 'top performance at an unbeatable price,'" said Brian Flood, Director of Product Development at Mushkin. "We are pleased to expand this award-winning product line with a new 30GB offering. Even the most demanding customers can now satisfy their performance needs at a price that just makes sense."